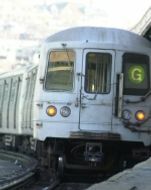 The six-week summer absence of the much-maligned Queens-bound subway line, scheduled to end after Labor Day, has actually been a godsend thanks to its above-ground replacement. “The shuttle is always there,” one mournful commuter told DNAinfo. “And it’s free.” Plus, cell service allows bored hipsters to post their semi-ironic, book-based Craigslist missed connections in real time.